The GASS-2040 conditions high-flow, high-moisture samples, eliminating acid mists or ammonia if present. It processes the toughest samples, with flows of up to 25 liters per minute and moisture contents in excess of 50%. The GASS-2040 can be mounted anywhere, including on the stack flange with an integral stack probe, which eliminates heated sample lines. The GASS-2040 contains three temperature-controlled zones mounted in an environmentally sealed, NEMA-4X housing. In the first zone, the sample passes through a heat exchanger, then through a coalescing particulate filter to remove particles down to 0.1 micron. Acid mists, if present, are coalesced then removed by an automatic drain. 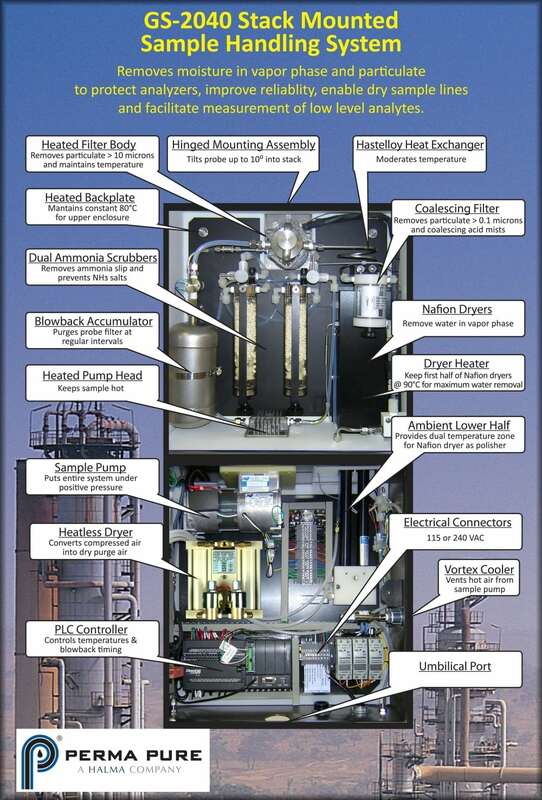 If ammonia is present, a proprietary ammonia scrubber removes it. In the second zone, the sample passes through a proprietary Nafion™ dryer. The initial portion of the dryer is heated above the sample dew point to prevent condensation and to create greater water vapor removal. In the third zone, the sample passes through the remainder of the dryer, further reducing the dew point down as low as -25°C, depending upon dryer model selected and sample flow rate. The system PLC with optional Ethernet connection for remote and flow controls for the dryer purge gas. Optional accessories, if required, such as a sample pump or pressure-swing air dryer for the purge air are also mounted here. This zone operates at ambient temperature so these controls and accessories do not overheat. When an integral sampling probe is added, the GASS-2040 can be mounted right on the stack flange. The probe filter and blowback assembly are mounted inside the GASS-2040, and the system PLC controls filter temperature and blowback timing. Conditioning the sample immediately after it leaves the stack improves its analytical calibration times, saving calibration gases.